Oh hey, broke my strand of “Don’t” titles. This arc still has no idea what it’s doing, but I like these two. We’ll get back to the mains….sometime? XD Maybe? 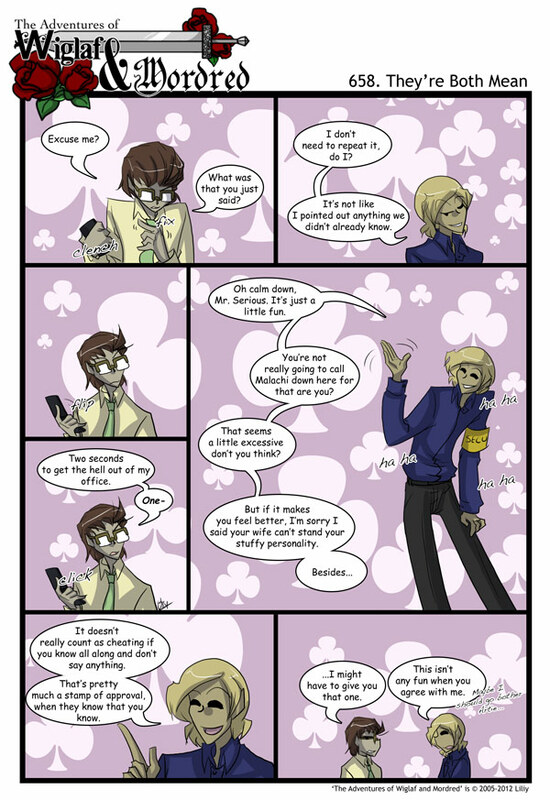 Oh my god, Security’s face in the second panel, so smug and cheeky. I love it! Hahaha. No time for lyrics tonight either, must be a good book. OMG his eyes are open again!!!! !!!!!!!!!!! ! ! !! !!!!!!!! !!!!!!!!!!!! !!!!!! !!!!!!!!! !! !!!! !! One, the most important revelation that Security uses science, not magic. Also, he used to be the Guardian, not Security. I don’t know what to do with that information yet. I want to focus on Malachi. Three, he’s scary. How do I know this? The threat of “calling him down here” was enough to make Security back off and apologize. He didn’t stop being a pain in the neck, but he wouldn’t be Security if he wasn’t a brat sometimes. Security can science his way out (that is a thing now) of any situation, as long as he’s conscious. Whatever Malachi is, he’s scary enough to scare the guy that cannot be caught. Also, we learned a lot about Arthur, Vilhelm, and Security’s relationship, most notably that Vilhelm calls Arthur by his first name and Security calls him “Artie.” I don’t know what to do with that either, mostly because Arthur isn’t that active of a character. So, I think that while the Garrott family is evil, they’re only minorly evil. Arthur is probably a force to be reckoned with, but he doesn’t seem to care what happens anymore. The real villain here is the shadow organization who’s been creating these artifacts and is still creating them. I’m really interested to see where this goes. That sounds almost like a quote from The Princes Bride. Cool! It will be interesting to know more about Malachi and learn what makes him so important. He must be a heavyweight character if it’s considered an extreme measure to call on him. He wanted the full half hour and all he got was the five minute argument …..
does she sleep with both of them? if not, why are they married?